With a new week ahead of us I figured some photographic inspiration was in order. The theme of this showcase is light. More specifically, the Northern Lights! 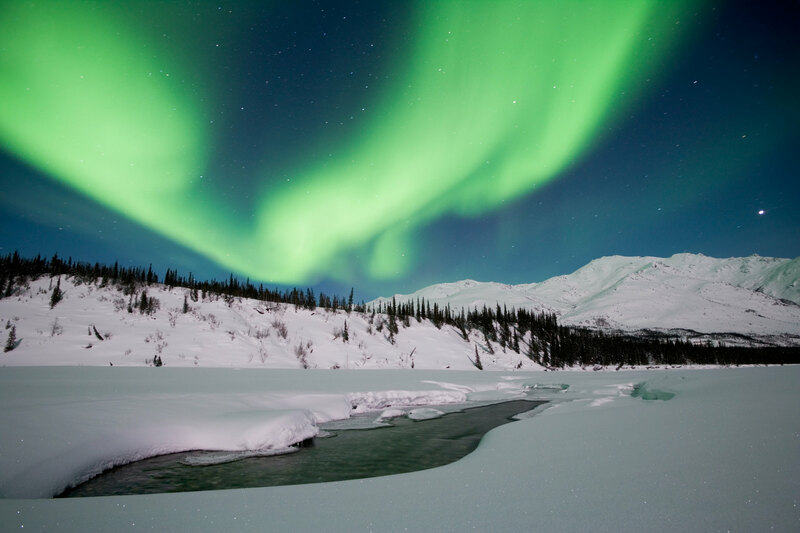 The aurora borealis is probably one of the most stunning natural phenomena. It can be difficult to photograph, but these crazy good photographers got some incredible results. Trust me - one look at these images, and you’ll be packing your car for an overnight trip north! So, explore these photos, get some great inspiration for your next photography outing, and learn a little bit about how to make your photos even better while you’re at it. Now that’s how you photograph the Northern Lights! Not only are the colors of this image spot on, but the other elements of the landscape help create a dramatic setting that only makes the colors of the night sky that much more impressive. Between the leading lines created by the stream to the enormous mountain peaks reaching toward the sky, there is no lack of visual cues to push our eyes upward. And the colors of the aurora reflected in the stream add that much more depth to the shot. Wow! One look at this photo should get your creative juices flowing! This is a perfect example of how to capture an effective photo of the night sky. The Northern Lights are on full display, and their deep, saturated color is enhanced by the flatness of the white and black tones that dominate the rest of the shot. 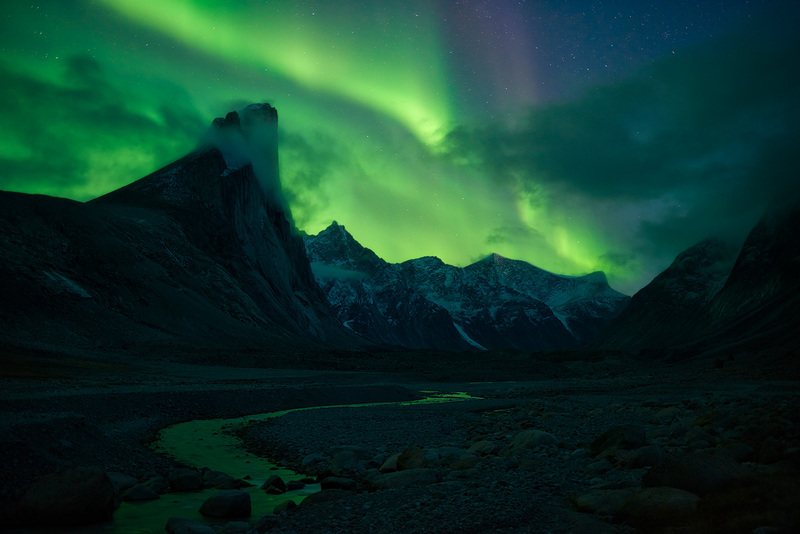 What’s more, the crispness of the mountain peaks set against the background of the sky makes for a nice contrast between the sharp edges of the terrain and the soft, flowing nature of the Northern Lights. Who knew that a toilet could look so good?! This photo is a prime example of how some of the most mundane objects can become the most beautiful subjects for a photograph. It’s just a matter of finding the right lighting, timing, and composition, and you could have a beautiful shot like this one on your hands. Note how the placement of the toilet in the frame just below the sweeping arch of the cloud above it adds to the whimsy of the shot. There’s no rule of thirds here, and it works great! Another prime example of how breaking the rule of thirds can result in an awfully compelling photo! The mountain peak is placed in the dead center of the frame, which works wonderfully for accentuating it’s size and shape. 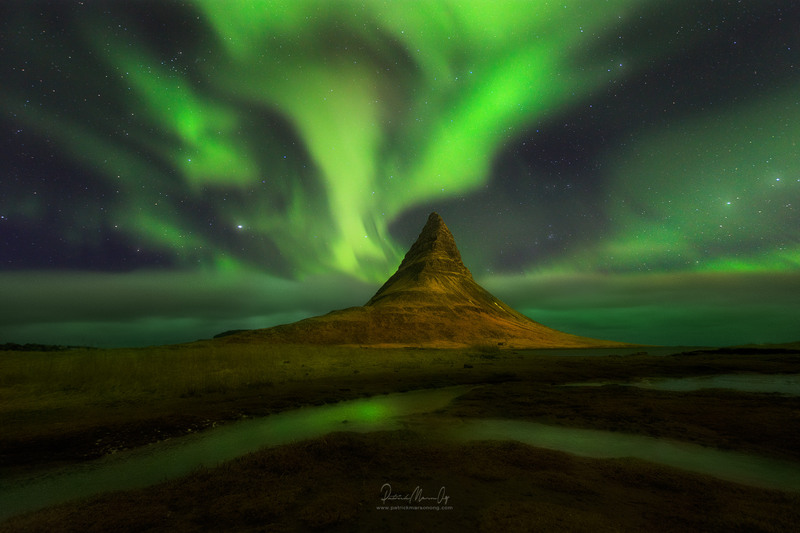 The way that the mountain peak looks as though it’s reaching up towards the Northern Lights is an interesting element as well. Again, we also see how the color of the sky gives the photo much-needed interest given the relatively flat colors of the landscape below. By combining a landscape with a townscape, this photographer managed to create an image with tons of visual interest without it feeling overwhelming. 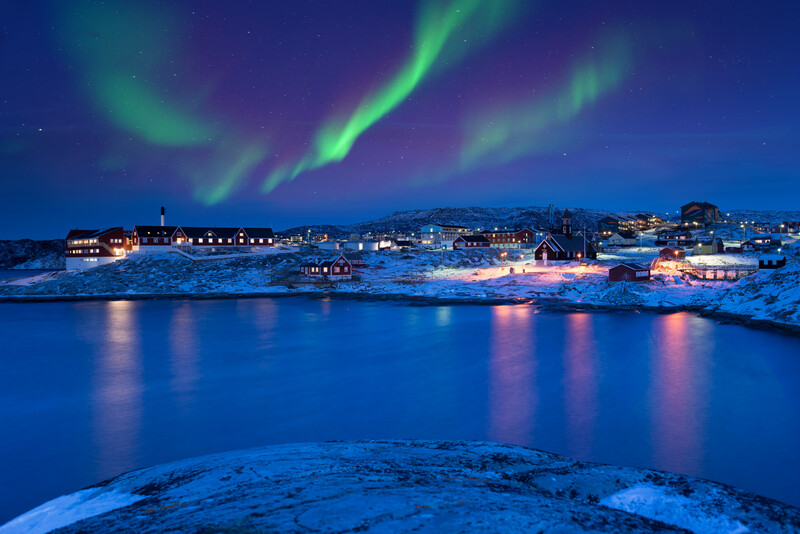 The gorgeous light of the Northern Lights is on full display, but is complemented with the twinkle of the town’s lights. The soft reflection of the town’s lights off of the water adds a bit more interest as well. The result? A beautifully layered photo that is a playground for the viewer’s eye. Shapes can be used in any kind of photo to add visual impact, and this image is a perfect example of that. The linear lines of the buildings in the midground provide a nice contrast to the looping swirl of the Northern Lights above. 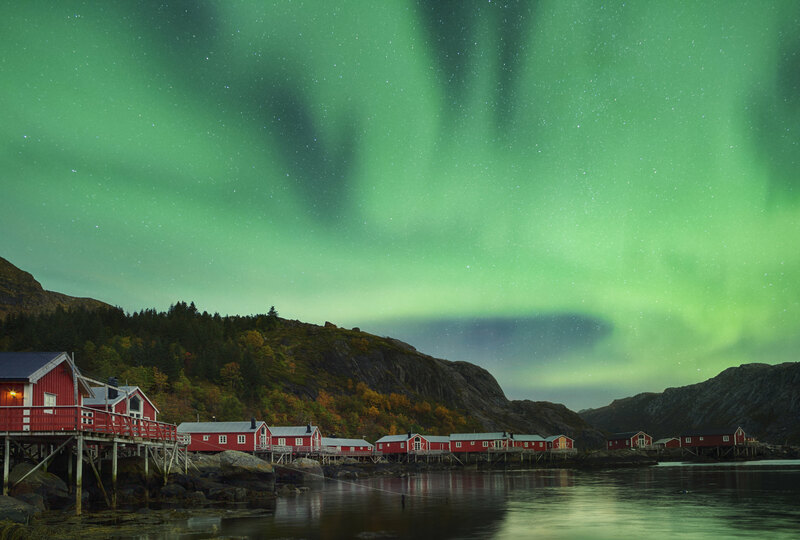 What’s more, we have an excellent idea of the scale of the scene with the buildings providing a familiar cue to judge the height and width of the Northern Lights. 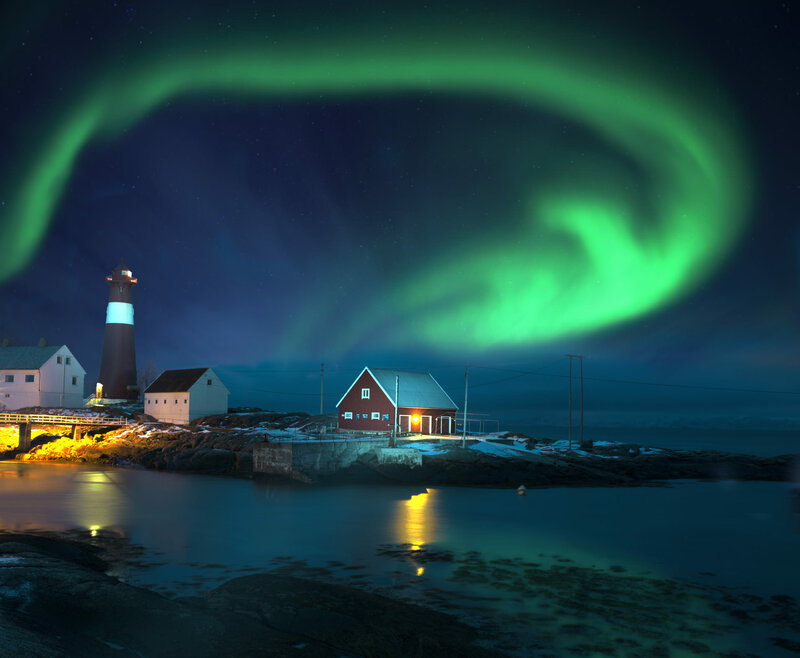 Foreground interest is important in just about any landscape, even ones in which the Northern Lights are the primary subject. Note in this image how the scattered array of icebergs gives the foreground some visual punch, but without overwhelming the shot. The jagged pattern created by the icebergs is a nice juxtaposition to the soft, flowing light in the sky. Note how the faint reflection of the Northern Lights in the water adds just a bit more depth to the shot as well. Sometimes, wintery landscapes can lack depth and detail because of the abundance of snow. However, as we see in the image above, this wintertime photo has plenty of depth because of the manner in which the photographer layered the shot. The leading line of the river in the foreground takes the eye from left to right, leading our eye to the mountain peaks in the midground. Then, above that, the glowing sky offers a nice dynamic that pumps up the visual interest in the otherwise snow-dominated scene. Here we have another excellent example of how combining a gorgeous landscape with a cityscape can generate a delightfully dimension-filled image. The long peninsula covered with buildings extends our eye deeper into the shot, giving us a clear understanding of the spatial relationship of the town to the distant mountains. 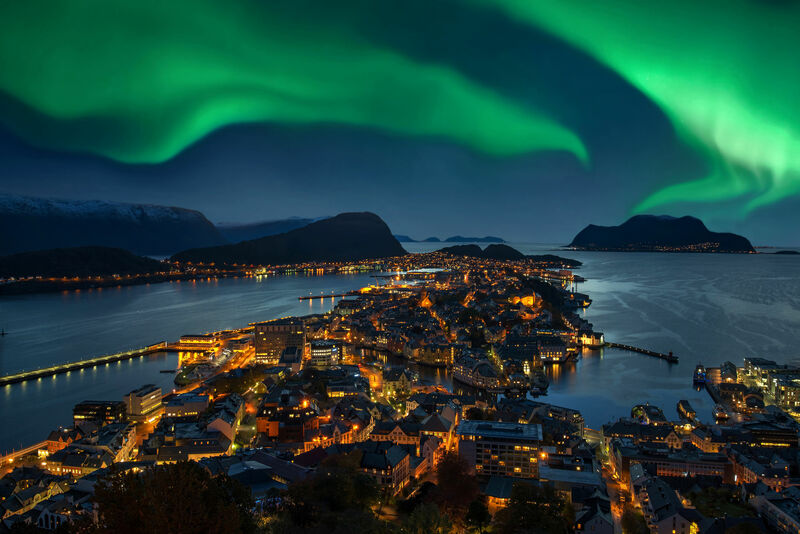 As in the earlier example, we again see how the lights of the city add some foreground interest, but without overwhelming the impact of the Northern Lights. This stunner of a photo shows us how texture is an excellent element in a landscape photo. 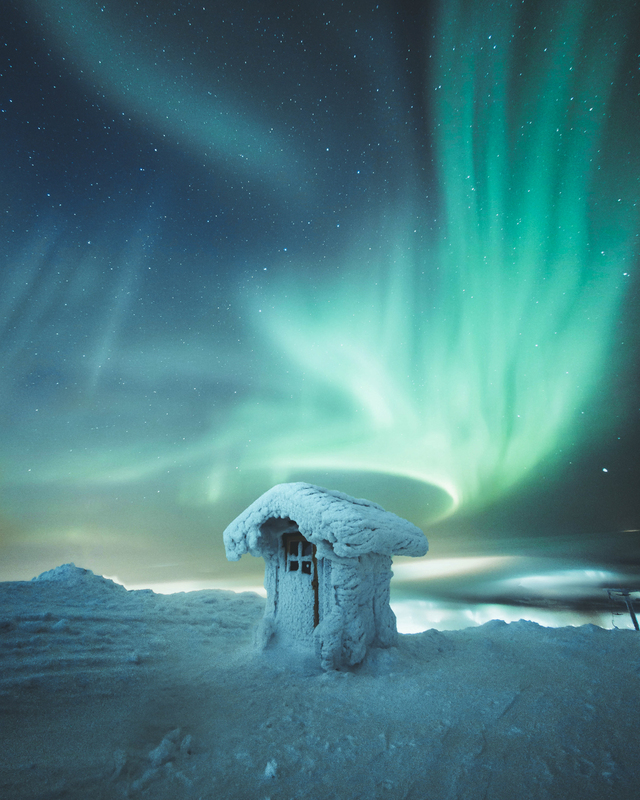 Though the Northern Lights are certainly the primary subject of the photograph, the foreground textures created by the landscape are certainly eye-catching. Not only do these textures act as perfect foreground interest, but they also give the image a greater level of depth. Also notice the human figure lurking in the midground - adding tiny elements like this is a great way to give your landscapes more interest. 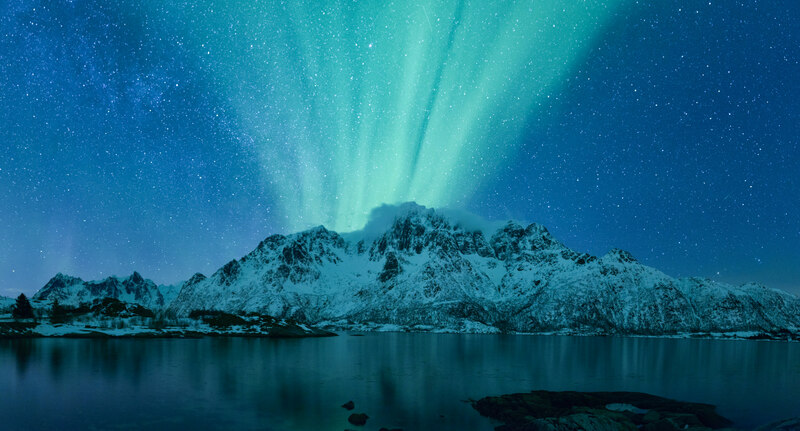 In this case, the Northern Lights take on an additional element of importance because not only do they provide a pop of color, but also contrast as well. 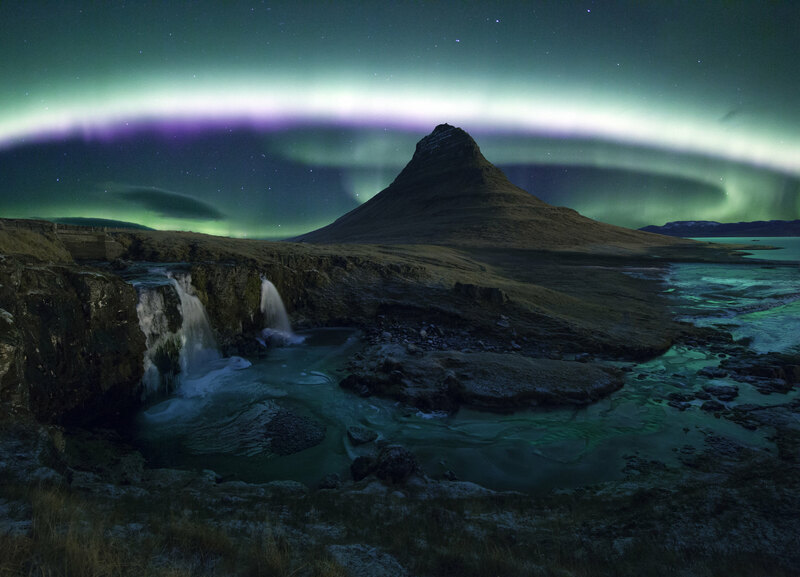 The bright white of the aurora immediately catches the eye because of the intense contrast with the relatively dark foreground and midground. But, that contrast isn’t so great that makes the image difficult to view. 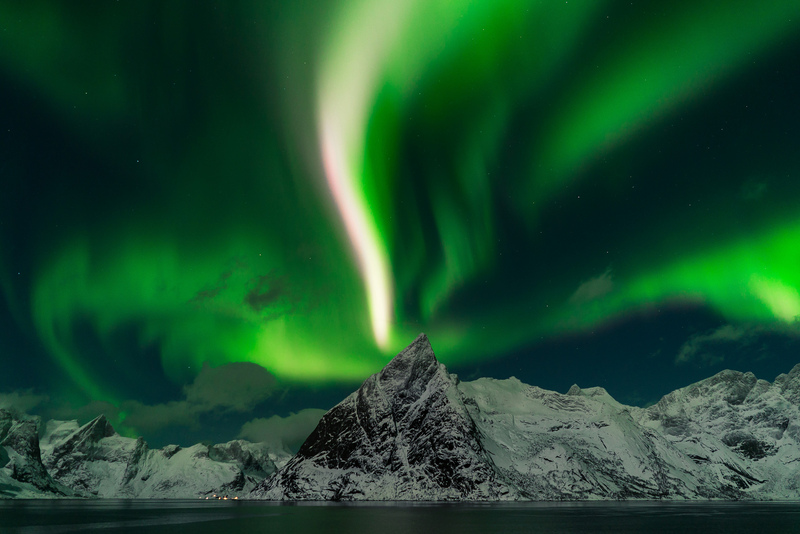 In fact, this example of the Northern Lights has a distinct alien or otherworldly vibe, don’t you think? The cool blue tones of the landscape in this photo provide a nice backdrop upon which the bright green Northern Lights take center stage. The shafts of light emerging from behind the mountaintop have a linear quality that gives this photo tons of depth. 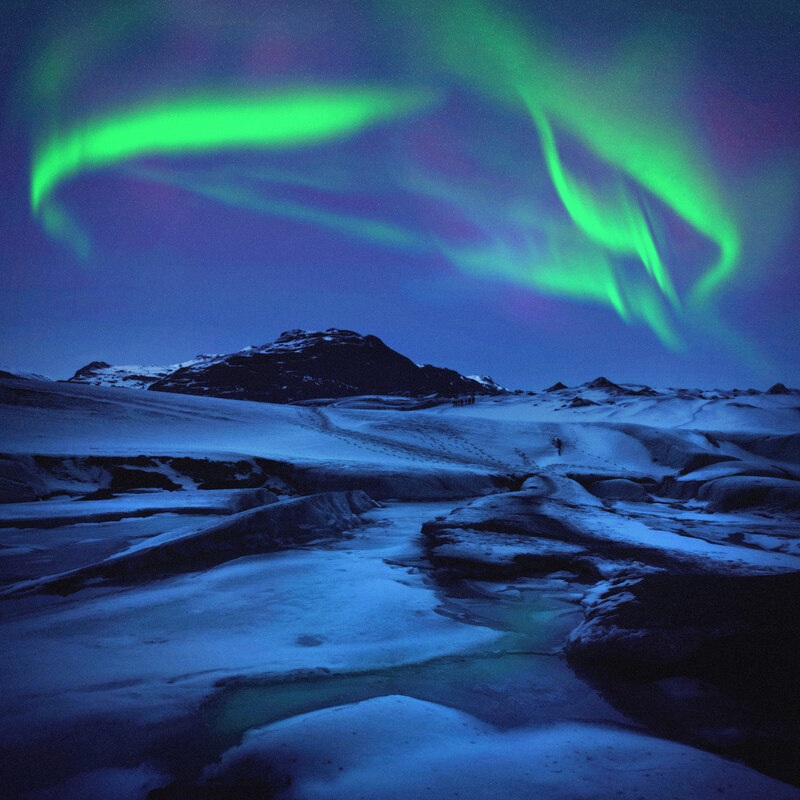 Like some of our other examples, this instance of the Northern Lights has an almost alien like vibe to it. You almost expect a spaceship to emerge from behind the mountain! But that’s the beauty of photography - done right, you can help viewers imagine all sorts of wonderful things! When taking landscape photos, reflections are an ideal vehicle by which to create a scene that has improved balance. 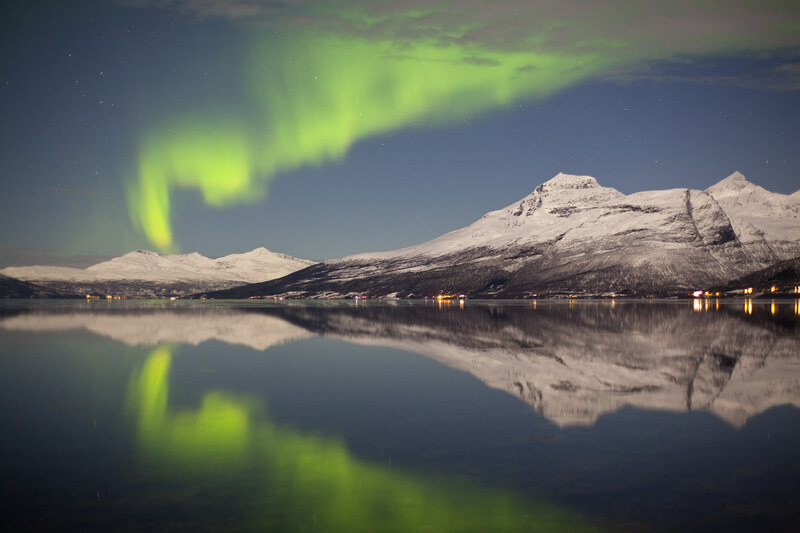 In this case, the reflection of the mountains and the Northern Lights double our pleasure, leading to a composition that has a nice flow from top to bottom. 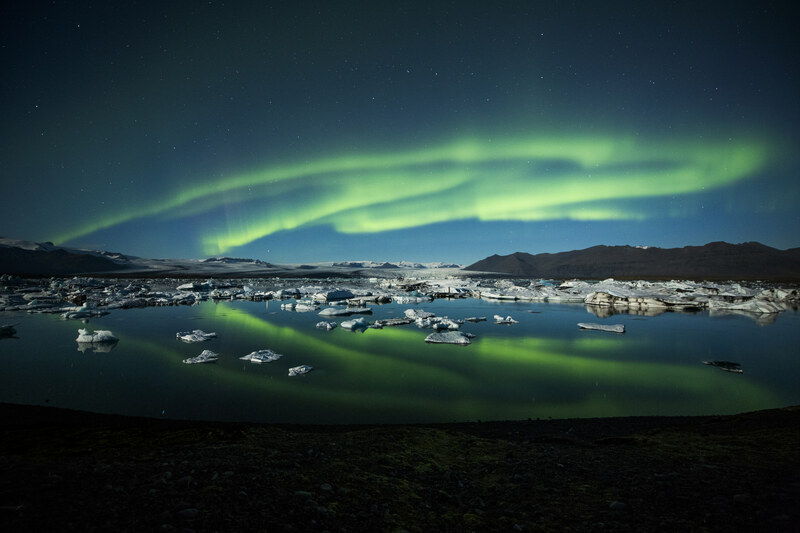 What’s more, the reflection of the green colors of the Northern Lights gives the image twice as much visual pop, while the tiny specks of light along the shoreline add a bit of depth and more visual interest. This image shows us that not every landscape needs to be taken in horizontal format. In fact, vertical format shooting is an ideal choice for instances in which the landscape subject is tall and thin. 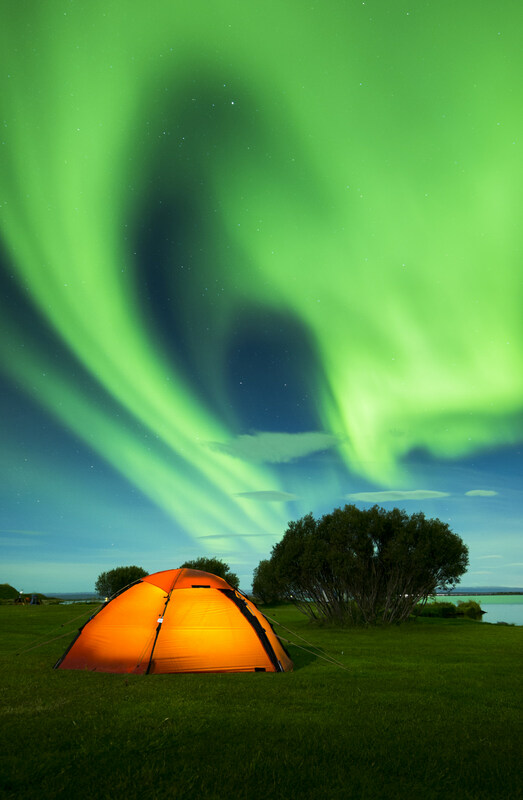 In this case, the vertical format restricts our view from left to right, forcing our eyes to gaze upon the sharp details of the photo, namely the colorful tent in the foreground and the Northern Lights in the background. When creating images of a landscape - even when the primary subject itself is colorful - don’t be afraid to incorporate other colorful elements. In this case, the deep reds of the buildings and the soft yellows of the foliage in the midground add more visual punch to the image while complementing the bright greens that dominate the sky above. Also note how the use of curved lines add interest - the curving shoreline is mimicked in the sky as the Northern Lights swoop around the mountain in the background. Not all leading lines in a landscape direct your eye to the left or right, or to the background for that matter. 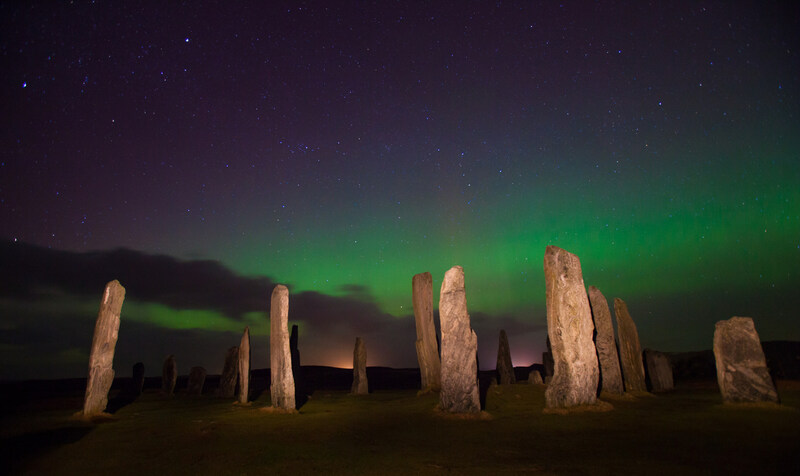 In this shot, the Callanish Stones push our eye skyward, where we get a glimpse of the beautiful layers of the night sky. 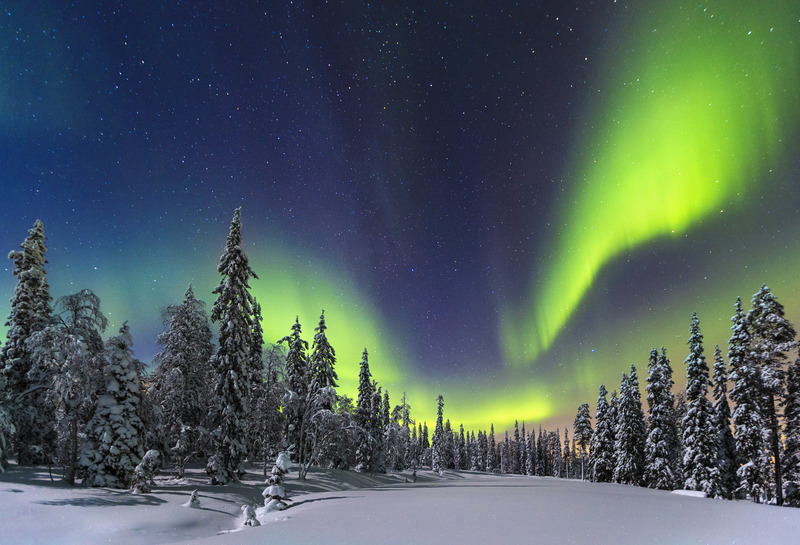 Note how the colors of the aurora blend softly into the darkness of the star-filled sky. Also note how the light along the horizon line from a distant city adds a pop of interest in that area of the frame. This image highlights several tricks you can use to improve your landscape images. 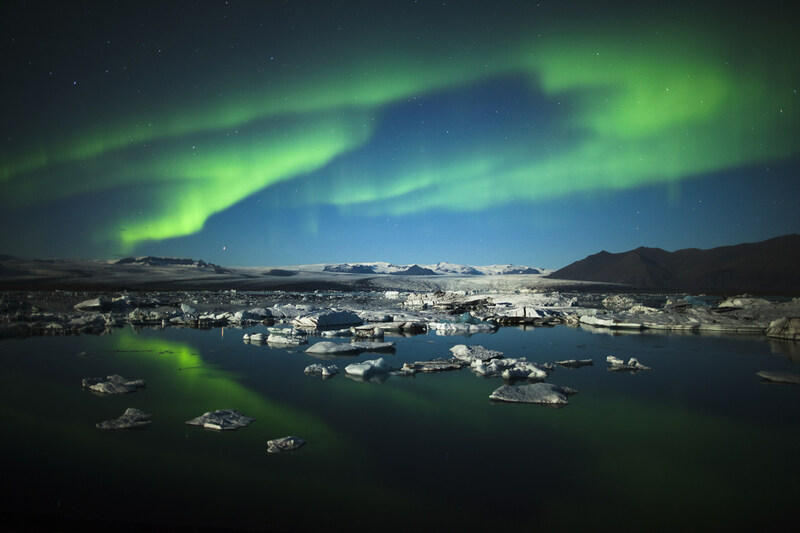 By shifting the horizon line to the bottom portion of the frame, a greater area of the photo is devoted to the sky, and as a consequence, the Northern Lights take on added importance. Notice as well how the sidelighting from the moon casts shadows from the trees, which gives the foreground of the shot a greater level of detail and depth. Finally, as in the previous image, the trees are used as leading lines to direct our attention straight upward toward the beautiful colors of the aurora. Like what you see? Would you like your photos featured on PhotographyTalk? It’s simple: just upload your photos to our galleries so our editors can see the work you’ve done. You never know...your photo could be the next “Inspirational Photo of the Day” or it could be featured in a showcase just like this! 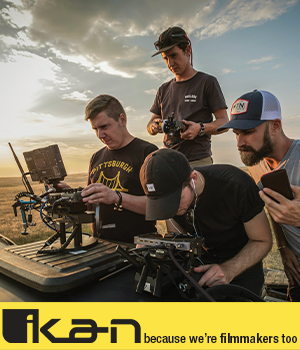 Get out there, take some photos, and show our editors exactly what you’re made of!